Look for the differences in the pictures and clues scattered around. This app exercises your observation and reasoning skills. You can help the little detective find out all doubts and get close to the truth. Cartoon style pictures give you different visual enjoyment. Wonderful animations catch your attention. A zoom feature makes it easy for you to find different points. A variety of themes suit your choices. Many highdefinition pictures meet your image quality requirements. Support you to play our game on the tablet. This free game wont let you stop playing. Are you ready to have fun in Find the differences? 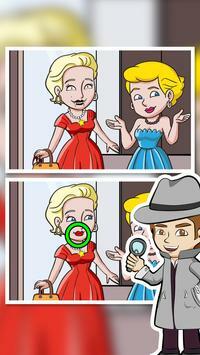 Please review Find The Differences Detective 3 Game and submit your comments below. We will collect all comments in an effort to determine whether the Find The Differences Detective 3 app is reliable, perform as expected and deliver the promised features and functionalities.